ProTek Devices' new PSRV-2LC series is offered in 3.3 and 5.0 rated standoff voltages. ProTek Devices today introduced a new series of low capacitance steering diode transient voltage suppressor arrays (TVS arrays) ideal for circuit protection in low voltage applications such as Ethernet 10/100/1000 Base T, USB, handheld electronics, video cards, and WAN/LAN equipment. The series is designed to protect two line pairs or four data/transmission lines. Circuit protection includes from the effects of electrostatic discharge (ESD) and electrical fast transients (EFT). The new PSRV-2LC series is offered in 3.3 and 5.0 rated standoff voltages. 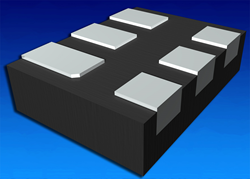 The 3.3 volt part provides low leakage current (1.0µA) and is less than 1.0 microampere. The low capacitance of the steering diode allows the electronics engineer designer to protect high speed data applications. The series is compatible with IEC standards 61000-4-2 (ESD): air: ±15kV and contact: ±8kV, with 61000-4-4 (EFT): 40A - 5/50ns, and with 61000-4-5 (surge): 24A, 8/20 micro seconds - level 2 (line-ground) and level 3 (line-line). The series also delivers 300 watts peak pulse power per Line (typical = 8/20 micro seconds). The new series is also RoHS and REACH compliant and has a flammability rating of UL 94V-0. The PSRV-2LC series is provided in a molded DFN-6 package with an approximate weight of only 9 milligrams. Pins 1-6, 2-5 and 3-4 must be connected via PCB traces. The package features lead-free pure-tin plating (annealed) and a solder reflow temperature (pure-tin Sn, 100) of 260-270 degrees Celsius. ProTek Devices’ PSRV-2LC series is delivered in minimum quantities of 3,000 devices on 8mm tape and reel, per EIA standard 481. Pricing information and purchasing details can be had by contacting any authorized distributor, representative, or directly with ProTek Devices. The company’s distributor and representative channels are available worldwide in the USA, Europe, Asia, Latin America and more. Full contact information for all worldwide regions can be found at the company website. In business 25 years, ProTek Devices™ is a privately held semiconductor company. The company offers a product line of overvoltage protection components and overcurrent protection components. These include transient voltage suppressor products (TVS arrays), avalanche breakdown diodes, steering diode TVS arrays, PPTC devices, and electronic SMD chip fuses. These components deliver circuit protection in various electronic systems against lightning; electrostatic discharge (ESD); nuclear electromagnetic pulses (NEMP); inductive switching; and electromagnetic interference / radio frequency interference (EMI / RFI). The company maintains its headquarters in Tempe, Ariz. More information is available at http://www.protekdevices.com. Note: Whether noted or not, references to certain words or names may be trademarks or registered trademarks of their respective owners.